An image published to Facebook shows a sculpture in the "Last Lockdown" series. 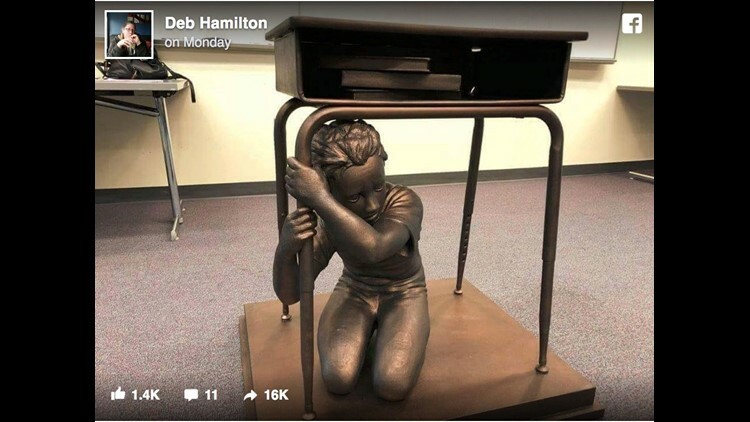 The small girl cowers beneath an open school desk, clutching a leg as she gazes into the distance with a look of fear in her eyes. The scene appears in sculptures produced with the help of Manuel Oliver, an artist who lost his 17-year-old son in the Parkland, Florida, mass shooting earlier this year. Actual desks make up part of sculptures, Chicago's WSL-TV reported, with the cowering girl produced from 3D printing — an intentional nod to the controversial rise of print-at-home guns. "We want you to feel unsettled," Sean Leonard, an advertising professional who worked with Oliver on the project, told WSL-TV. Leonard and Oliver worked with Giffords, the gun control group founded by shooting survivor and former congresswoman Gabby Giffords, to produce 10 of the sculptures titled "The Last Lockdown." Etched into the tops of each desk are stats on gun violence — "22 kids are shot every day in America," one reads — along with a number to text to prompt voter registration, according to a statement from the nonprofit. Oliver said the art-fueled activism comes in memory of his son, Joaquin Oliver. “It’s too late for us to save Joaquin from gun violence, but through art my family and I are making sure that we protect the rest of the kids out there,” Oliver said. Organizers displayed the works at events nationwide last Saturday with the goal of moving voters to support candidates supporting gun control efforts. Organizers with Giffords and Change the Ref, a gun control group founded by Oliver, placed the sculptures in 10 congressional districts from Parkland to Irvine, California, all places "where elected officials have long prioritized the gun lobby’s agenda," according to Giffords. Facebook user Deb Hamilton published an image of one of the sculptures Monday. Many of the displays coincided with voter registration drives, the group said. More: Should kids be allowed to play with toy guns?